Blazing, metaphorical pageant, over two torturous hours of “man’s inhumanity to man”; director Michael Noer’s, valiant attempt to recreate 1973’s scenario, starring Steve McQueen and Dustin Hoffman, struggles and sluggishly sinks into a lethargic morass; Charlie Hunnam (“The Lost City of Z”), in McQueen’s role of “Papillon”, doffs close to fifty pounds (aka, Michael Fassbender in 2008’s “Hunger”) as a prisoner of the French Penal Colony, French Guiana, in the 1930’s, falsely accused of murder; consummately perfect for the role, but too much time is devoted to his years in solitary confinement, frustrations of doomed escapes, until, after fourteen years he accomplishes the unfathomable; sighs of relief from viewers drowning in melodramatic sensationalism. 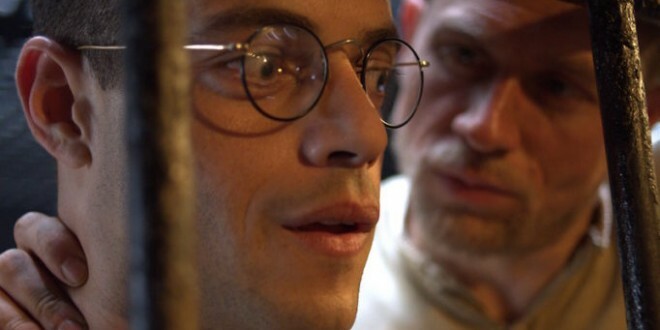 Based on the book “Papillon” (Butterfly), by Henri Charrier, (1906-1973); mighty injections of poetic license, glorifying his travails; published in 1969, it provided major cinematic fodder, resulting in a stunning box office success; Rami Malek (“Mr. Robot”) depicts Hoffman’s role of “Dega”, wealthy, erudite forger/painter, sidekick of Papillon; stilted, robotic performance, replaced midway through the feature, by his genuine, resilient, steadfast loyalty to Papillon. Happy to see these wonderful words again from you, Penelope. Just wanted to give a big MUST SEE to BlackkKlansman; it is a movie that one leaves totally unable to catch your breath from for a while! Terrific music, dialogue, photography, scenes that made you look beyond the front view and asking you to listen with care while viewing. I also live in AL and the story is not all old!!! !